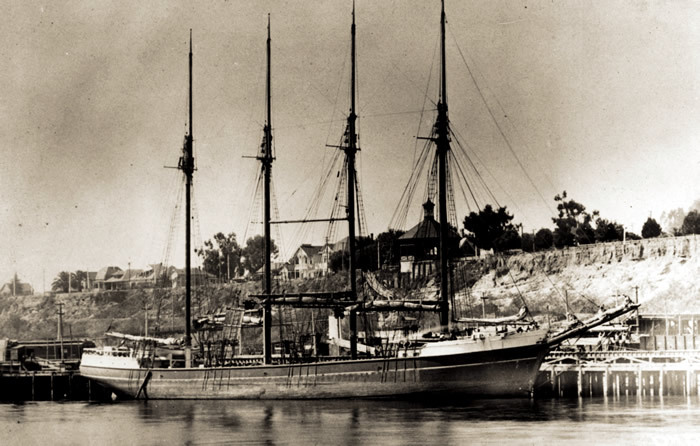 Oregon-built four-masted schooner Churchill, lost at French Frigate Shoals in 1917. Credit: Tall Ships of San Francisco. 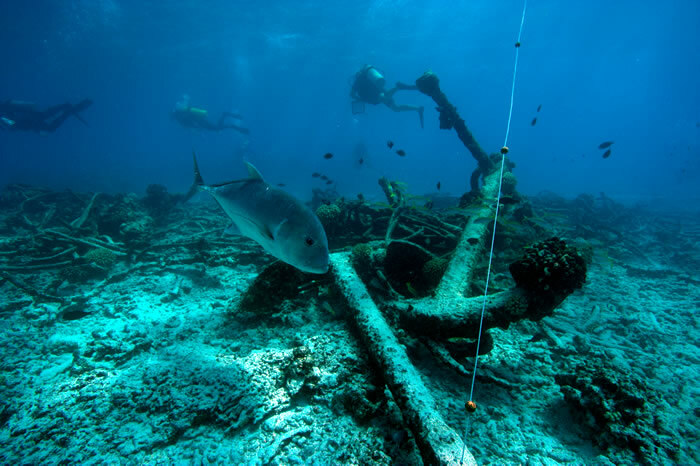 In October of 2005, the Pacific Islands Fisheries Science Center's Coral Reef Ecosystem Division reported a potential shipwreck site to NOAA's Maritime Heritage Program after tow boarding over anchors and scattered rigging at French Frigate Shoals. 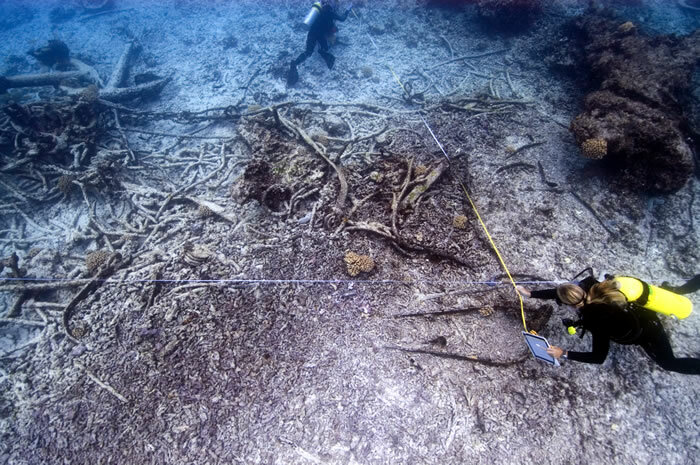 In 2007, a team of NOAA maritime archaeologists were able to begin to investigate the site. 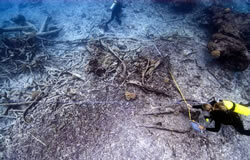 The 2007 survey uncovered clues that may help solve the mystery of the unidentified shipwreck. Researchers speculate that the site may likely be the four-masted schooner Churchill, which is known to have been lost in the area in 1917. Diagnostic artifacts at the site including parts of the windlass, three large iron anchors, ship's pumps, and numerous blocks and rigging components appear consistent with the 178-foot, 600-ton schooner Churchill. Anchors, rigging, pumps and deck equipment all correspond to the Churchill's size and construction. The Churchill was built in North Bend, Oregon and launched in April, 1900 by shipwright Asa Meade Simpson. 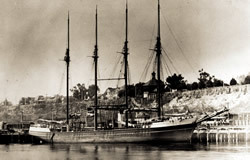 Large wooden schooners were the economic mainstay of American shipping between the Civil War period and World War I. They were the sailing workhorses of the Pacific. Maritime archaeologists take measurements at the Churchill shipwreck site in order to make a site plan. Credit: NOAA/Casserley. The Churchill was carrying a cargo of copra (the dried meat or nut of the coconut) from Nukualofa, Tonga, to Seattle, Washington, when she ran aground on a reef at French Frigate Shoals on Sept. 27, 1917. All members of her 12-man crew were rescued by a nearby vessel. Subsequently, the Churchill's crew filed affidavits charging Captain Charles Granzow with the intentional destruction of the ship. A mysterious fire broke out after he had sent the others away in the small boats. 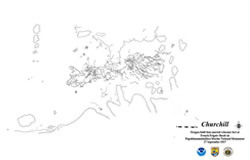 In August of 2008, a team of NOAA maritime archaeologists returned to the site to complete documentation and interpretation of the shipwreck site. Over the course of three days, the team fully mapped the site on the seafloor and created a site plan. In addition, the team collected dozens of photographs and high definition video footage of the site. 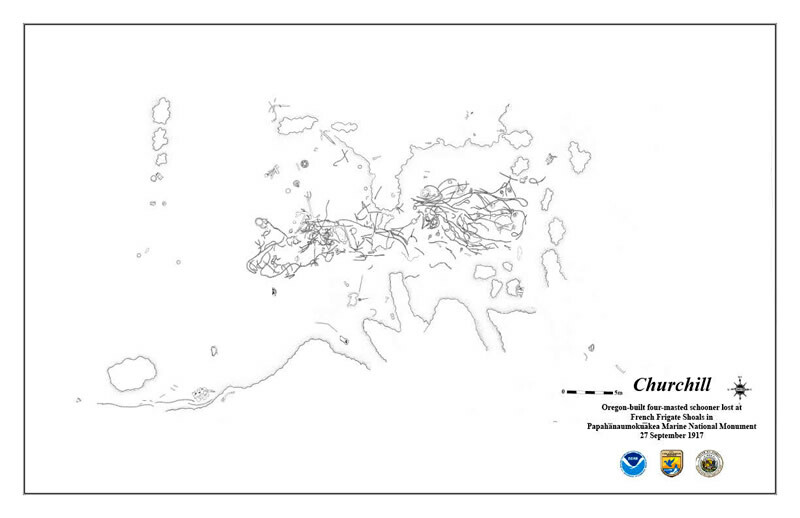 Site plan of Churchill shipwreck completed in 2008. 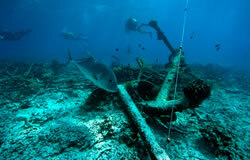 Anchors resting at the Churchill shipwreck site at French Frigate Shoals. Credit: NOAA/Casserley.